Olympia Motorcycle Tires offers high end brake pad replacements. 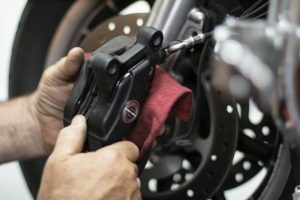 We stock most Harley pads and can provide a quick turnaround when it comes to brake pad replacements. If we do not have your street bike pads in stock we can special order and have them onsite normally within 48 hours. We strive for quick turnaround times on brake pad replacements to get you back on your bike as soon as possible. Brake Pads need to be replace in the range of 25,000 – 40,000 miles depending on riding styles. Daily commuting in stop and go freeway traffic will decrease your motorcycle brake pad life. Harley Davidson recommends all 2008-2011 Touring models with ABS brakes have fluid changed every 2 years with HD Platinum DOT4. Our Bel-Ray Super DOT4 meets and exceeds this product. The Bel-Ray brand that we carry is tested to the highest standards. The Bel-Ray even tests above and beyond those required of DOT. We stock EBC Double HH Sintered brake pads as we have proven they are a premium long life pad with improved fade resistance and heat cycling for heavy street bikes, cruisers and superbikes. No matter your riding style, one of the most important safety factor to your motorcycle is quality brakes. At Olympia Motorcycle we inspect your brakes at every tire change to give you the option of changing pads prior to disc damage, created by low pad thickness.